I’m going to kick off my “Watch a Day” series with a most unlikely timepiece: Swatch’s 2014 Sistem51. Now that the newness has worn off, I see my little red plastic wonder for what it is: A traditional plastic Swatch with a nice little secret inside. It’s not a revolutionary timepiece or really all that special at all. But I enjoyed learning about it and hunting for one of the first in the USA. And, most importantly, I enjoy wearing it. When Swatch announced at BaselWorld 2013 that they would mass produce a Swiss mechanical watch at affordable prices, enthusiasts went wild. Breathless stories enthused about how Sistem51 would open the doors to a new generation of enthusiasts and re-ignite the “Swatch fever” that swept the world with the original “plastic fantastic” Swatch watches. Legitimate watch bloggers hunted for their first Sistem51, importing early models from Switzerland at huge markups. ABlogToWatch gushed, “A low price, technical innovation so far unseen before, and marvelous aesthetic qualities” and Hodinkee claimed, “this could be a game-changer”. But what would the public think? It wasn’t a game-changer. Although promised at 100 SFr (just over $100), the Sistem51 was slow to market and started at $150. Rather than being an affordable entry to mechanical watches, the selection of Sistem51 watches remain, for casual watch buyers, a puzzlingly large and premium-priced minority in a sea of more-attainable quartz offerings. And this situation is not helped by the fact that half of today’s Sistem51 offerings are cased in metal and start at $215. If this cheap automatic failed to make a splash on the mass market, it’s finding a niche among enthusiasts. Although Sistem51 hasn’t knocked Seiko and Orient from their perch as “the first mechanical watch you should buy” on most forums, it has become a respectable alternative. They like the history (the “51” refers to the number of components in the original 1983 Swatch quartz movement as well as the current mechanical) and the fact that $150 is attainable for younger and newer enthusiasts. Even Hodinkee has a special edition. As evidenced by the name, Swatch’s Sistem51 buzz was all about the movement. Assembled from 51 components (an homage to the original 1983 Swatch quartz), the movement is primarily made of ARCAP, an alloy of copper, nickel, and zinc with long life and anti-magnetic qualities. The single screw at the center of the rotor holds the moving components together, along with a number of welds represented on the dial as a constellation of large white dots. The movement’s 19 jewels are also reflected on the dial, this time as smaller red dots, a motif that has continued with new designs and colorways. The movement is assembled by robots, adjusted using a laser, and hermetically sealed for long life. This presents a challenge for collectors, since the movement can never be adjusted or serviced. Surely it won’t last forever – then what? But the Sistem51 isn’t really a collector’s piece after all. It’s all about wearing a cheap mechanical with serious historical ties. I was one of those enthusiastic watch lovers who sought a Sistem51 on launch. They weren’t available when I was in Switzerland in 2013, but I still managed to buy one on launch in the USA. Swatch decked out special boutiques when they finally arrived, and I happened to be in San Francisco during launch week. It was a satisfying 6-month hunt! The Sistem51 is a rather large and thick watch, especially by Swatch standards, but it wears extremely well. The strap attaches low in the integrated lugs and is made of a rubber material. Color-coordinated stitching gives it a sporty look, and the strap is long enough for large wrists. The whole unit is incredibly lightweight and comfortable even after hours of wear. But all is not perfect in Sistem51 land. The bi-directional winding tends to spin loudly with certain wrist movements, giving a little surprise throughout the day. And I’ve found that it doesn’t wind well, often stopping a few times during the first hour on the wrist. 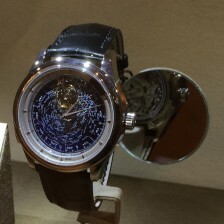 It ticks fairly loudly as well, at least compared with high-end metal-cased watches. The tiny date window is just about useless, especially the red-on-black version I own. And the crown is tiny, hard to pull, and fiddly to use. Overall, the Swatch Sistem51 is a decent watch. Setting aside the hype, it’s nice to have a new plastic Swatch that even an enthusiast can enjoy. I’ll be enjoying it today!